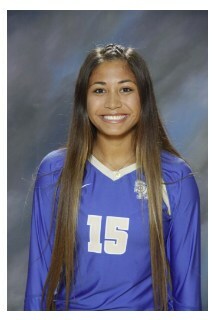 Sarah shares her experience of being a part of the girls volleyball Division I California State Championship team after sweeping James Logan of Union City, 3-0. The 2017 state title clinches the sixth state championship in school history and the second in the girls volleyball program, with the first dating back to 1999.
eatured in Orange County Catholic Newspaper. We are so proud of you Cristina for not only being a “Rosary Academy’s Tennis Standout”, but also for being a great role model for our student/athletes. Congratulations, Matthew Slater, Class of 1999. Congratulations to SJDL alumnus Matt Slater on being named this year's recipient of the Athletes in Action Bart Starr Award. The award is given annually to an NFL player who exemplifies character and leadership on and off the field. Click this link to watch a video of Matthew receiving the award. We are proud of you, Matt! In recent years, the students who have taken part in Showtime and our annual spring musicals have really been stealing the spotlight in their respective high schools. Father John Neneman, Saint Jeanne Class of 1977, ministers as Rector/Chaplain at Mater Dei High School. Recently published his third book. Congratulations Juan!